When mountain ranges make for glowing natural backdrops, and lakes invite you to tour and discover, and moments of enjoyment provide lasting inspiration – then it’s a summer in the Bern Region and the Bernese Oberland. Grindelwald will be showcasing its acting and musical skills this summer with the performance of "Alpenglühen". 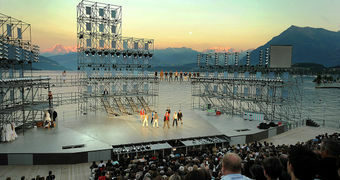 This theatrical music production, which focusses on the town from its beginnings to the present day, will also delight spectators with its direct view of the glacier gorge and the Fiescherhörner. And in June, Meiringen in the beautiful Haslital valley will be presenting a superlative theatrical spectacle – the Volkstheater Festival, being held for the first time, will also be offering courses, excursions and culinary delights in addition to performances. Its patron is Beat Schlatter, a prominent actor. The extensively renovated Schadau Castle in Thun offers a magnificent setting for visitors to enjoy. As of June, the hotel and restaurant with their splendid new look and views over Lake Thun are sure to impress you with their sophisticated and extended range of culinary delights. Stand Up Paddling (SUP) is not only popular in Hawaii. On the turquoise-blue Lake Brienz, expert guides give tips on fun paddling and here you can discover hidden beaches by "walking on water". Stay fit and enjoy the breathtaking mountain scenery while on the water, it’s simply SUPer! Set sail and set off onto the lake with a view of the Eiger, Mönch and Jungfrau. You can do this from May to September on Lake Thun every Thursday evening with an experienced skipper from the Lake Thun sailing club and without previous knowledge. On your return from fun on the lake, enjoy an aperitif in the historic boathouse. With its mountain panorama and UNESCO World Heritage Site status, Kandersteg exudes a fascination all of its own. Three barrier-free circular hiking trails now take you along the level valley floor and guarantee wheelchair-accessible fun for all ages from May to October. The 63rd Gstaad Menuhin Festival features one of the most dazzling female pianists, the Chinese Yuja Wang, in the Saanen church in Gstaad with the theme of "Paris". In addition to other top international artists, the audience will also be wowed by a concertante performance of "Carmen". Three days of reportage, narration and public events. The Reportagen Festival Bern at the end of August provides a unique insight into the fascination of the international reporter’s lifestyle and the obstacles and dangers they face. For the 20th time now, Gstaad will be hosting spectacular beach volleyball matches in an intensely competitive atmosphere. The Swatch Major Gstaad with its authentic beach ambience and set amid the magnificent Alps in the month of July has lost none of its charm. Pop-up coworking, as the flexible workplace is called, is centrally located at the Tourist Centre in Adelboden. 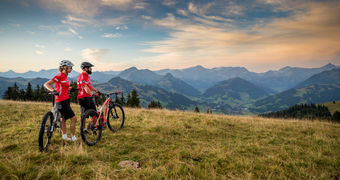 With its shared infrastructure – including the fastest internet connection in the Alps – and the inspiring mountain scenery, locals and visitors alike can find temporary office spaces here. The natural "Bärgbier" from Adelboden is not only well known because of its many different varieties. After a visit, the proprietors love to personally conduct tastings for groups of 5 or more people.